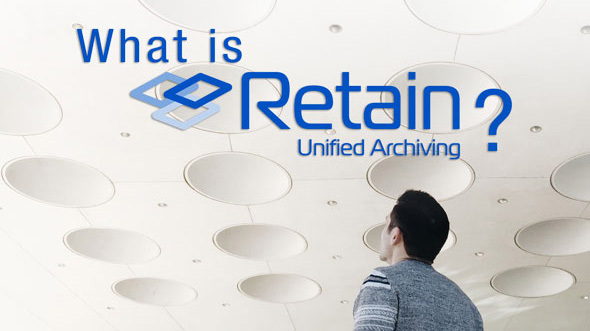 Over the past years, we have received a number of questions about Retain Unified Archiving. People want to know the what and why…the how. Does it really do what we say it does? What are the benefits? Why do I need to archive my data? You may want to know how much it costs to manage your data, or may want to know how well Retain works, and why it is the best option for your organization. We’ll get to those answers in a bit, but let’s get some of the other basic questions that we often hear out of the way. How do I archive Office 365? Use Retain! Can Retain archive Exchange? Of course. We still use GroupWise. Do you archive GroupWise? You think you know GroupWise, but you merely adopted GroupWise. We were born with it and moulded by it! We were the first company to create an antivirus agent for Groupwise, and were one of the first to start archiving GroupWise. So…yes, Retain works with GroupWise. What about Gmail? We archive Gmail and Google Apps for Education. Retain is a great replacement for Google Vault. Does Retain archive data from social media? Not only do we archive social media messages for Facebook, Twitter, LinkedIn, Instagram, Flickr, Pinterest, and Google+, as well as archiving all YouTube and Vimeo videos and comments. Can you archive my company’s mobile device message data? Yes, we can. Can you archive Blackberry? Check. What about iPhones? Retain can archive all iOS devices on your network. Now that those basic questions are out of the way, let’s get to the top seven questions about Retain. 1. How is Retain different from other archiving solutions? Two words – Unified Archiving. Retain is one of the only solutions on the market that stores all your electronic communication data in one central archive. All your email, mobile, social media, instant message and web search data is archived together, and is easily searched, accessed and can be exported for eDiscovery or an investigation. This unified access allows you to have just one archiving solution for all of your messaging data. Other products require that you have one archive for email, a seperate one for social media, and yet another for mobile data. By having a unified archive, you can access and search all of your communication data from one central location. Do one search and all the message data associated with that search is retrieved. It does not matter what kind of message it is—email, social media, instant messaging or mobile—the results are available from the central search. Reduce the complexity of your archive, by having just one solution for all of your content. The specific data sources that Retain archives are Exchange, Office 365, Gmail and GroupWise email, Facebook, Twitter, Yammer and LinkedIn social media, plus Yahoo!, AIM (Aol Instant Messenger), Google Hangouts and Lync/Skype for Business instant messaging and Google, Yahoo!, Bing, Wikipedia and YouTube web searches. Our website has a lot more information about Retain Unified Archiving. 2. Does Retain Offer Cloud Archiving? Yes. While a large number of our customers prefer to manage their own local on-premises server, the number of customers using our cloud email archiving service is increasing on a daily basis. Retain Cloud Archiving reduces your maintenance costs, protects your bandwidth, and frees up resources for your strategic business initiatives. Plus, Retain Cloud Archiving delivers all the same benefits of an on-prem server, like eDiscovery management, data security, and simplified access, but without the additional costs. On average, cloud services save 35% year-over-year in comparison to on-premise installations. Get a quote for cloud archiving! 3. How do I manage and archive the data created by our company’s mobile devices? Retain archives message data from BlackBerry, Android, and iOS mobile devices. The types of mobile communication data, and how the data is captured, depends on the devices in use at your business. For BlackBerry, Retain integrates directly with the BlackBerry Enterprise Service (BES) to pull and archive all phone call logs, MMS/SMS messages, PIN and BBM data and delivers it in a format that is searchable and usable, without the need for an app on the phone. On Android, you would install an app on the phone that downloads all of the SMS/MMS messages and phone call logs and pushes them to the Retain archive. For iOS, Retain integrates with CellTrust SecureLine to archive encrypted SMS text messages and phone call logs. The CellTrust SecureLine app creates a second mobile business number, that your employees would use to make calls and send text messages. This second number, or account, separates the business content from the personal content. This app can also be used on Android devices. Policy-based mobile phone call recording is also available for iOS, Android, and BlackBerry. Plus, Retain features integration with BBM Enterprise to archive BBM Enterprise messages directly from the app, on iOS, Android and BlackBerry. Learn more about Retain Mobile! 4. Some of my employees use multiple mobile devices. How does Retain manage data for users with multiple devices? Technically it does not matter how many devices Shelby has, or the types of devices she’s using. She could have a BlackBerry Passport, a Samsung Galaxy Note, and an iPad. Retain ties all of her devices, and the communication data from her devices to the her as a user. Once she authenticates to Retain on each device, her business data is archived under her login. So no matter how many devices, Retain archives the data, and it archives the device data to the specific user. Note: Retain Mobile is priced per device being archived. Get a no obligation quote for Retain Mobile! 5. What about eDiscovery? How can Retain help us? Retain features powerful built-in eDiscovery tools. Retain allows organizations to search all the archived business communication data within one central archive and to perform other important tasks such as place litigation holds, redact, strikeout, tag, create policies for archiving (message type, message source, the age of a message, amount of time to store a message, and attachments), export, and delete messages. Retain also allows you to grant rights to specifically named users who can access the archive. This means that your Legal department, Auditors, and other named users can access the entire archive, while end-users can only access their personal archive. Plus, all activity in Retain is logged in the Audit Logs, ensuring that you will know what has been viewed and searched within your archive. When a search is completed, the archived message data can be exported to PST, PDF, or to the stand-alone archive publisher. The publisher contains its own archive viewer, and is a fully-indexed, portable archive of the searched data. The publisher allows you to search the exported dataset, redact, strikeout, and export again to PDF. The portable archive can be placed on a DVD, USB thumb drive, or other portable media. It can even be password protected and uploaded to DropBox or another similar file sharing service, or can be handed off to an outside legal team or auditor. 6. How does Retain work with Office 365? Exchange? Gmail? GroupWise? Retain archives email for Office 365, Exchange, Gmail, and GroupWise. In addition to archiving email, Retain captures and archives additional data differently based on the platform. For Office 365 and Exchange, Retain integrates directly with the Exchange or Office 365 servers and archives the email using impersonation or journaling. Retain archives all email, attachments, files, appointments, and other calendar items. Retain also features an Outlook plugin, that allows users to access the archive directly from the Outlook client, as well as the Outlook Web App (OWA). Retain also provides the ability to cache archived data based on specified criteria. For Gmail, Retain integrates directly with Gmail to archive messages. Unlike other solutions that use SMTP connections to archive Gmail, Retain authenticates to the Google Apps server through an IMAP connection. In fact, the 2014 Gartner Magic Quadrant for Enterprise Information Archiving states, “Retain is one of the few archiving solutions that offers native Gmail archiving support.” Retain archives all Gmail messages, Gmail notes, files, attachments, appointments, and calendar items (iCalendar only). We were also awarded as a Champion of email archiving by Infotech Research Group! Finally, for GroupWise, Retain integrates directly with the GroupWise server to archive all email, attachments, files, appointments, tasks, and other calendar items. We have plenty more information about archiving email with Retain. 7. What does Retain cost? What’s the cost benefit? Retain is priced per seat for email and social media archiving, and is priced per device for mobile archiving. There is a base price for Retain that includes the server and email archiving. For social media, mobile, and instant messaging there is an additional fee for those modules. The pricing varies depending on organization size and industry. And yes the cost is worth it, for two reasons. First, with Retain you pay for one solution that archives all of your electronic communication data, which means you don’t need to purchase a separate solution for each type of messaging that you are going to manage. Second, your data archive is an investment. It may cost you more upfront, but you will more than make up for it in increased productivity, decreased downtime and storage, and if you are involved in litigation, the eDiscovery and legal time savings will more than pay for your archive. That is not to mention the fact that with Retain you can free up your IT staff’s time, so they can spend it on their core competencies. It is also important to point out that Retain was recently awarded the Best Overall Value for email archiving by InfoTech Research Group, scoring a perfect 100! It’s easy to get a FREE Quote! 1. Download a FREE 30-Day Trial! 2. Get a no obligation quote! 5. Learn more about Retain! 6. Do you have any additional questions about Retain? Shoot us an email!